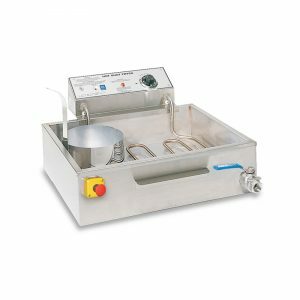 #8050D FW-12 Fryer | Pronto Pup Co., Inc. The standard of the industry for large Funnel Cake and Elephant Ear Fryers. Easily work four 8″ Funnel Cakes, two large diameter Elephant Ears or 12 French Waffles. 5500 Watts. 22 1/2″W x 171/4″D. Cook surface 21″ x 15 3/4″. 27 lb cooking oil capacity.